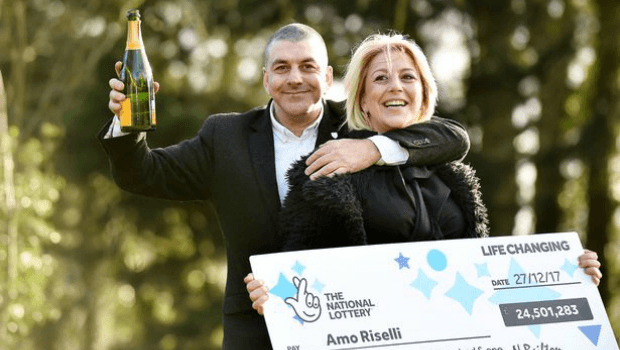 Thanks to his mother for storing his winning ticket safe in her lucky glass jar up in the cupboard, Amo Riselli, 50, has won over £24.5m in the Lotto. This all happened after the massive jackpot rolled down to those who had matched five numbers and the bonus ball as opposed to matching all the balls. The cab driver had the news confirmed by Camelot after he made the purchase from Seymour Road Post Office in Gloucester, England. The location of the winning ticket purchase is somewhat surprising considering the Lottery published a list of the most lucky post codes and Gloucester wasn't even near the top. Initially thinking that he had won £240,000, Mr Riselli was informed by his brother over the phone that he had actually earned £24.5m from his lucky endeavour. While waiting for the Camelot offices to reopen, he continued to drive customers over the festive period in his cab. "I can’t believe that it’s actually happened to me for real! I called my brother Marco. I was shaking like a leaf and I told him I’d won £240k. He asked what numbers I’d got and when I told him he cried: ’You’ve won the whole jackpot of £24m’. It’s an amazing feeling and I’m absolutely over the moon." Following the life changing win, a trip to Las Vegas and a massive party to celebrate with work friends from the Grosvenor taxi rank is now on the horizon for Mr Riselli, as is a four bedroom house with a swimming pool in the Gloucester area, where he has lived his entire life. In the draw, which took place on December 27th, nobody managed to get all six balls and Mr Riselli was the only person to match five including the bonus balls. Whenever no 6-ball winners are found, 5-ball are then used. The numbers won with were 18, 36, 48, 57, 58, 59 and the bonus ball was 50. The National Lottery must be bought through their own dedicated services but players looking to play the lottery without actually having to drive to a local shop and purchase a physical ticket can utilise online lottery sites to buy tickets for other major lottery draw as well as bet on the lottery and even join virtual syndicates!